It had been 3 years since our last river cruise and we decided that it was time to hit the river again. 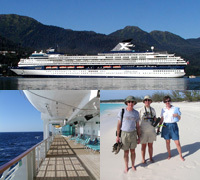 Of course a single cruise wasn't enough, so Marjorie looked for two cruises that we could "back-to-back". 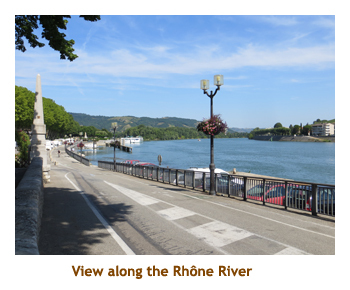 We really wanted to do the Rhone River in France so started by choosing a Uniworld cruise (that offered T/A rates) from Lyon to Avignon. We also wanted to try an AMA cruise (that offered T/A rates) in Germany, but the closest fit still left 7 days between the two cruises. 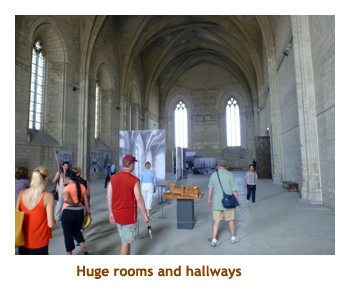 So, we opted to do an intervening land tour, 2 days in Avignon and 5 days in Brussels. 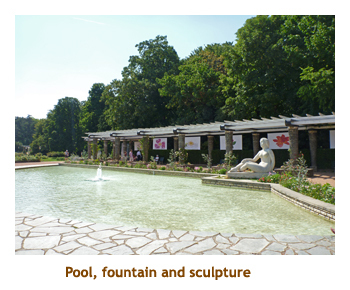 The Rhine cruise that we chose did a 2 day pre-stay in Prague, then Nuremberg to Luxembourg on the Main / Rhine / Mosel rivers. The travel logistics of our trip would be: fly to Lyon, cruise to Avignon, train to Brussels, fly to Prague, bus to Nuremberg, cruise to Luxembourg (Remich), fly home. We had to plan hotels for Lyon (1 night), Avignon (2 nights), Brussels (5 nights) and Prague (2 nights). Lots to organize! It was a very busy trip that took us to 36 cities / towns / villages, most of which we had never been to before. As a result, I have arbitrarily split this trip into three diaries - this one covering the first river cruise, Lyon through Avignon, a second diary covering the land portion of our trip, Avignon and Brussels, and a third diary covering the second river cruise, Prague through Luxembourg. 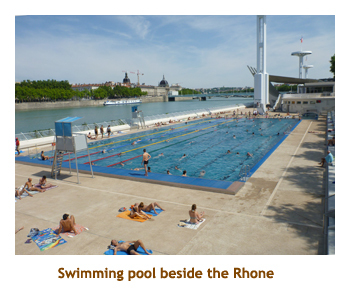 The Rhone River cruise was with Uniworld, our fourth cruise with them. The ship, the S.S. Catherine, was gorgeous. The latest innovation was a small indoor swimming pool, although it didn't get much use. The service and food were excellent. My only complaint was the late dining time - 7:00 PM. Note: In 2012 Uniworld offered free beer and wine at meals only, while Scenic Tours offered free drinks any time of the day. This year Uniworld has free drinks at any time of the day. Yahoo! The cruise was not full - only 121 passengers with room for 159 total. Perhaps that's why they were offering T/A rates. We met a number of T/A's on the cruise. It was a hot cruise, with temperatures being in the mid 30's each day with lots of sun. 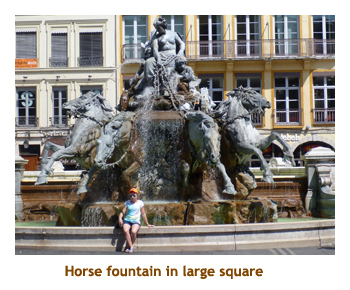 The northern half of the cruise was in the Rhone-Alps region, while the southern half was in the Provence region. 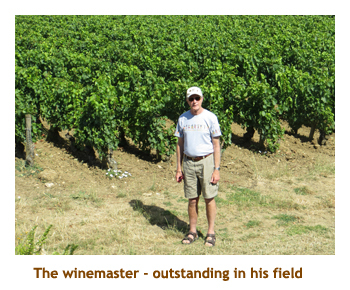 We actually hit the Burgundy region as well when we popped up to Beaune. Finally, there were 3 "pay for" optional excursions offered, but we didn't do any of them. People who went seemed to enjoy them. July 10 - The airport shuttle picked us up from home about noon and we were at the airport by 12:30. We had lots of time to check in and do security. After boarding the flight to Frankfurt, we sat at the gate for about an hour. We never did hear any explanation for the delay. We had a 4.5 hour connection time in Frankfurt, so the delay was inconsequential in the bigger view. At Frankfurt, we were bused from the plane to the terminal building, went through EU customs, reclaimed our checked luggage, walked a mile to another terminal building, rechecked our luggage, went through security and finally got to our departure gate with lots of time to spare. Once again we were bused to the plane and then set off for Lyon. 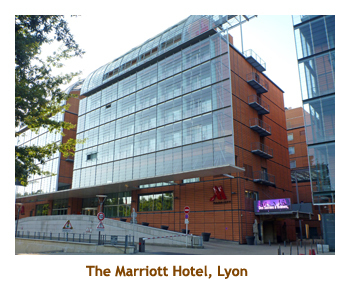 July 11 - We arrived in Lyon about 2:30 PM and had pre-arranged a shuttle to the hotel (Marriott). Fortunately they had a room ready for us. 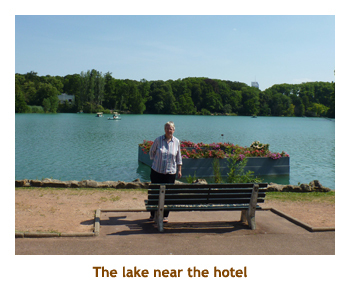 The hotel was set next to a huge park with gardens and a large lake. 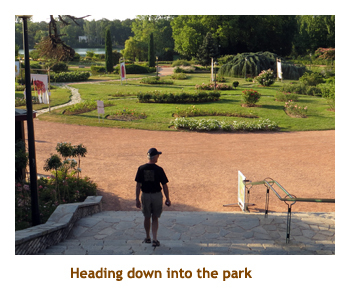 We walked around the park gardens for a while and then went for a beer in the hotel. It was really hot out! We finally packed it in by 6:30 PM and did the sleeping pill trick. Had a good sleep! We woke up early and had to read for a while waiting for the 7:00 AM breakfast to open. After breakfast we headed out to the park and decided to walk right around the lake. It took us about 40 minutes, quicker than I thought. Lots of walkers, runners and bikers everywhere. 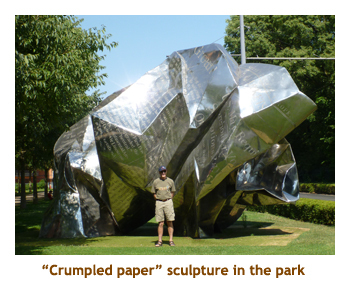 It was a beautiful park! We were back to the hotel to check out at 11:00 AM. We caught a cab and were to the ship dock in less than half an hour. The dock was right in the core of the city. We checked in to the ship, dumped our carry-ons in the cabin and then had lunch. Afterwards we did a walk across the bridge to Presqu'ile and walked around the downtown area. We were looking for a grocery store but, being Sunday, not much was open. We really enjoyed our walk despite the heat. Just along the dock from our ship was a huge swimming pool complex with 3 pools for swimming lengths, family fun and a wading pool. Back on board, muster was at 5:00 PM and we sailed at 6:00 heading north to Macon. 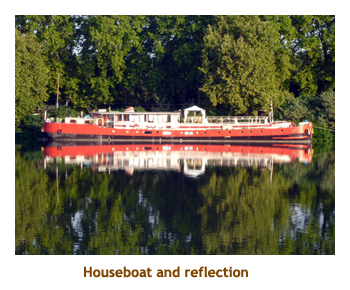 We were at the northernmost navigable point of the Rhone River, so had to switch to the Saone River to continue north. Meanwhile, I managed to squeeze in the Wimbledon final while waiting for dinner. Dinner was at 7:00 and we were back to our room by 9:00. Once again it was sleeping pill time and I would be switched onto local time by tomorrow. We were up early at 6:00 and checked email until breakfast time. We had arrived at Macon overnight. 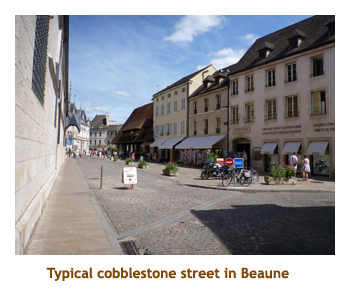 Our 9:00 AM tour today took us (by bus) about an hour north to Beaune, right in the heart of the Burgundy region. Yes, it really does exist! Along the road we stopped at a vinyard belonging to Puligny-Montrachet to check out the grapes. 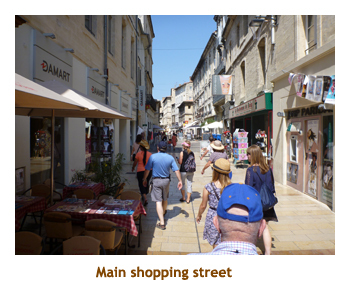 Once in Beaune, we did a short "get your bearings" tour of the town and then were left for two hours on our own to explore the village and have some lunch. 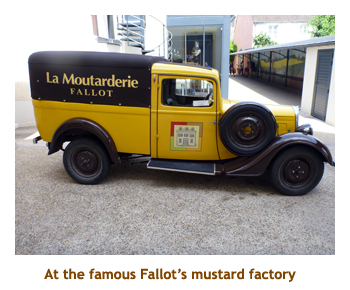 Our first priority was to find the famous Fallot's mustard shop. 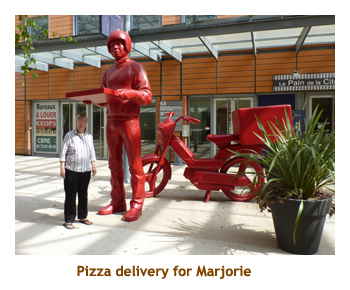 It wasn't far and Marjorie got some mustard for the kids. 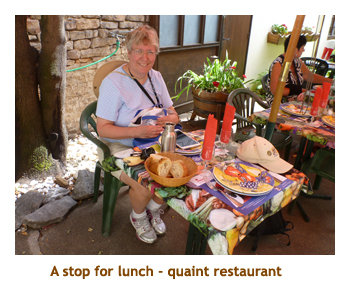 We continued to walk around the village and discovered a small alleyway restaurant for lunch. I had a wonderful salad and a local beer. It was quite warm out by now, hitting 31 degrees. 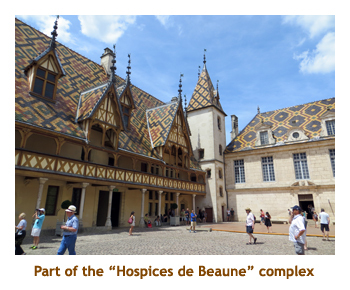 Our time had run out, and we met back in the central square for a tour of the famous Hospices de Beaune charity hospital, founded in 1443. It was a large complex and very interesting. At 2:45 we reboarded our bus and drove back to our ship in Macon. We spent an hour or so reading and then watched the sail away at 5:00. At 6:00 there was a Captain's reception followed by dinner. I had veal fillet. We watched as the ship passed through a lock and then headed to bed. 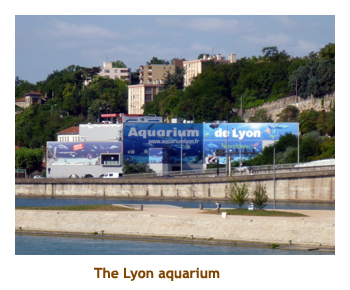 Overnight, we sailed south on the Saone River to the confluence with the Rhone in Lyon. We were already there when we woke at 6:00. It was going to be a hot day - forecast for 34 degrees. We had planned to look for a grocery store at some point today as things were closed two days ago owing to it being a Sunday. 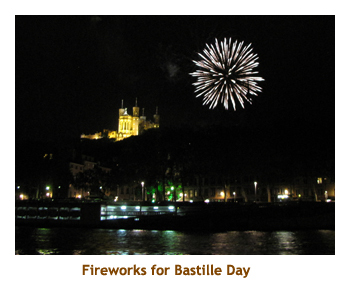 But we were stymied again because today was Bastille Day (like July 1 in Canada or July 4 in the US) and everything was closed! We had breakfast and then headed off on separate tours, about 9:00 AM. 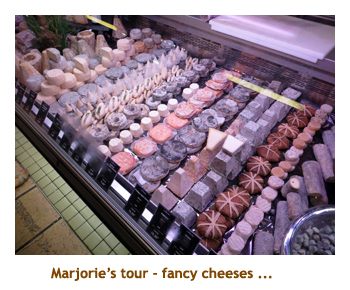 Marjorie did a "Lyon Gourmet" tour that toured the old town and then visited a market where gourmet foods could be found. It included a wine tasting with various finger foods to sample. I joined a biking tour with 14 other riders for a 12 km tour of the city. I hadn't ridden in a while and it was going to be stinking hot, but I felt I was up for it. The first part of the tour was great. 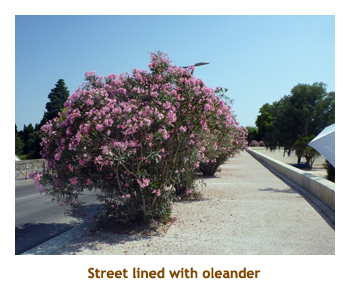 There is a wide pedestrian area along the east bank of the Rhone with lots of room for bikes, runners and walkers. 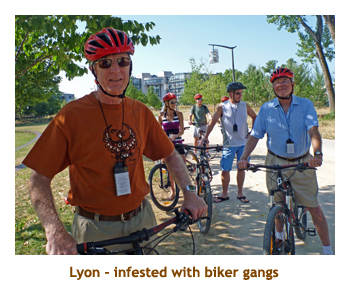 We rode south unimpeded with our Vox devices on as our guide told us facts about the city. Lovely! When we reached the point where the Saone runs into the Rhone, we crossed a bridge over to the Presqu'ile area where there was no bicycle pathway. 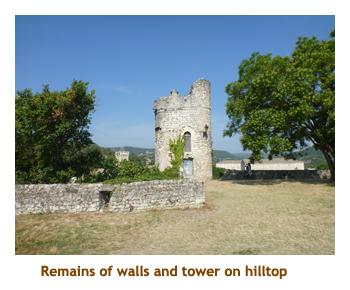 The Presqu'ile is a peninsula of land formed between the Saone and the Rhone, which run parallel to each other. From here we headed north facing traffic lights, crosswalks and city traffic. 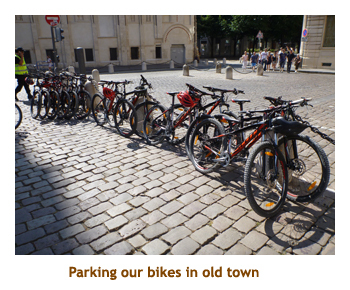 When we got to the old town we parked our bikes and did a walking tour. Then we jumped back on our bikes and continued north a ways past where our ship was docked. We did another bridge across to the east side of the Rhone and encountered the wonderful parkway again, on which we rode back to the ship. We were back by 12:30 and ready for lunch. For the afternoon we relaxed and read and wandered the dock area. It was too hot to go far. For dinner I had penne pasta. At 9:00 PM we headed back ashore for a city lights tour. Three double decker buses were waiting for us, but only 8 people showed up. We sat as a small group with our tour guide on one of the open top buses and had a private tour of the city. We were back at the ship by 10:00 in time for the 10:30 Bastille Day fireworks show. From the top deck of our ship we had an excellenrt view of the show. 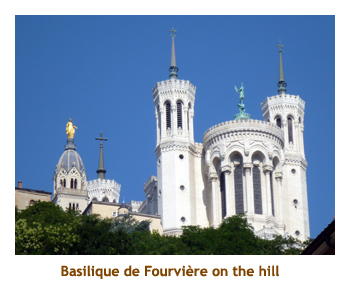 The fireworks were launched from the Basilica of Notre-Dame de Fourviere that we had seen close up during our bike tour. Then it was to bed. My best ever Bastille Day!! 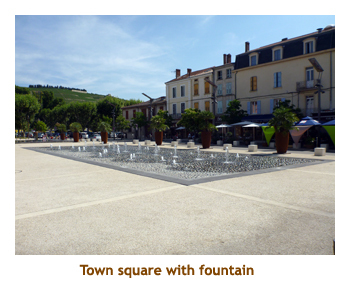 Today we would be visiting the "twin" villages of Tournon and Tain l'Hermitage. 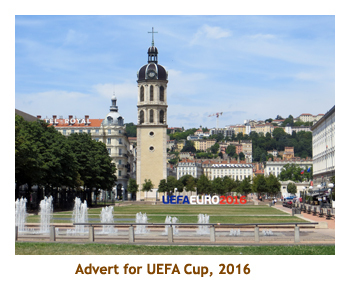 They are on opposite sides of the Rhone River, separated by a small bridge, much like Buda and Pest (except on a much, much smaller scale). 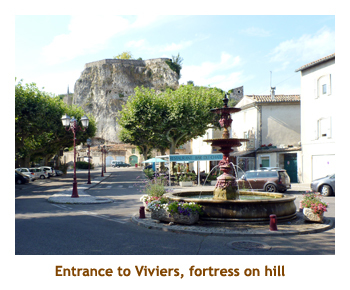 In fact, not only are they separate villages, they are in separate regions of France! 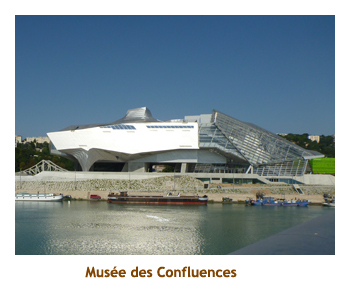 (The Rhone River is the boundary between the regions). We were up at 7:00 on this warm day forecast to hit 34 degrees. We had breakfast and then set out on a walking tour of the villages. 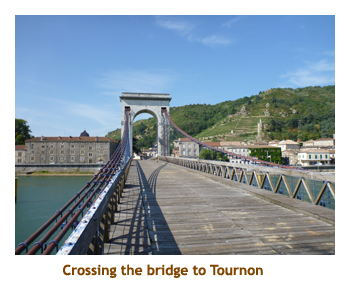 We crossed over the bridge to Tournon and explored around the village. 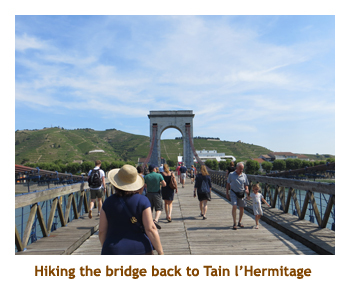 Then we recrossed the bridge and did the same thing around Tain l'Hermitage. We were grouped into four walking groups, and each group went to a different winery for a tasting (to keep the tasting sessions small). 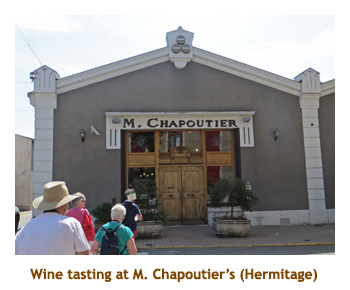 Our group went to the winery of M. Chapoutier. We tasted wines from the St. Joseph and the Hermitage appelations. After the tasting we had about 15 minutes before the ship was sailing. 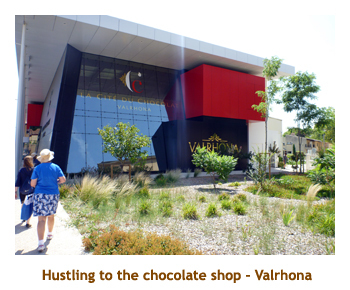 We hustled to a chocolate shop so Marjorie could buy some French chocolate. We made sure that we left the shop before some of the other cruisers that were doing the same thing so even though we got to the ship a few minutes late, we weren't the last ones! (There were 7 more after us). We had lunch aboard as we set sail for Viviers. We planned to spend some time sitting on the top deck and watching the scenery, but it was very hot and the sun shades were collapsed due to some oncoming low bridges. At 3:00, Marjorie went to a cooking demo on making Crepe Suzettes. While she cooked, I did some reading and enjoyed the view from our "balcony" window. Our wall-to-wall window was split horizontally and the top pane was motorized to go up and down (like a car window), so the top half of the window could be opened. A second motor drive raised and lowered a bug screen. 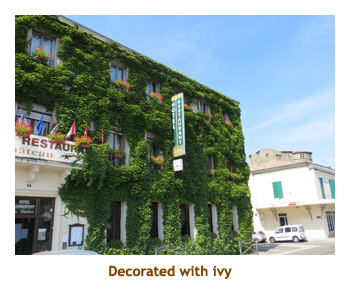 We attended the port talk at 6:45 and then had dinner as we arrived in Viviers. 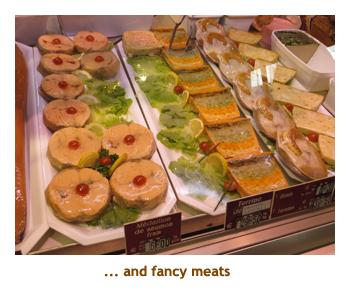 I had the veal fillets which were very good. 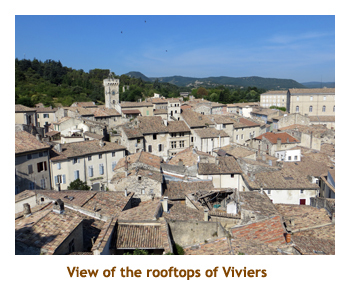 Viviers is a small village (pop. 3,500). For our after dinner stroll (9:00 PM) we walked the short distance into the town and wandered around until the sun started to set. It was a lovely little town and we were looking forward to the guided tour tomorrow. We were up by 7:00 and attacked our breakfast. The omelet chef, Giorgi from Bulgaria, knew my likes by now and always did mine "with everything". Then we were off on our tour. We had been told that a guide named Francis was the best, so we asked to be in her group. She was a very interesting and spry lady of about 70 years of age. 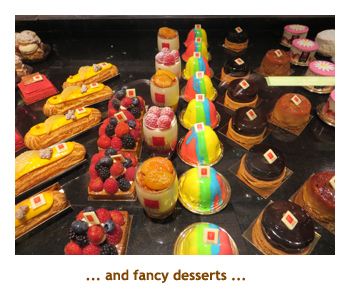 We were split into four walking groups and each promised a treat at the end of the tour. 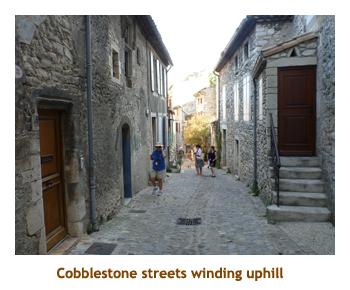 We did a walking tour of the village, taking a winding road up a hill to the top where we had an excellent view of the village. 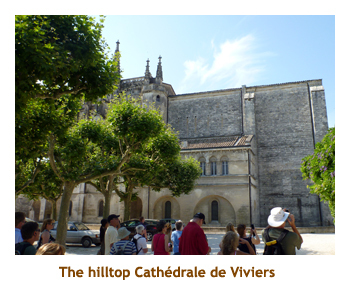 Also on top was the Cathedrale de Viviers where we were treated to a short organ recital of works by local composers. Lovely! Then we walked back down into the village for our "treat". 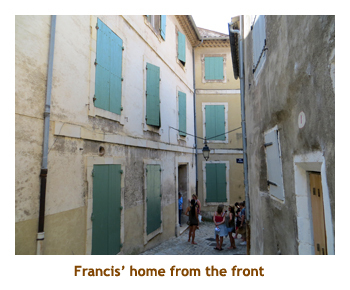 Francis took us to her home - a 400 year old, three story house, part of a row of buildings built against the hill. The house was a real maze - passing through one room to get to another, stone staircases that only went up one flight, secret passageways, etc. None of the rooms were on the exact same level - always a step or two up or down from room to room. Someone mentioned that there were 11 bedrooms, but I think there were a bit less. The house had a lot of history and Francis was proud of her family who, during the years of WW-II, harboured over 200 Jews on their way to safety. 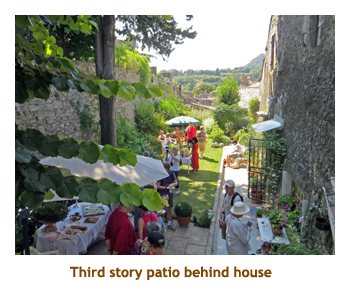 A lovely "backyard" patio and garden was accessed from the kitchen on the top floor at the back of the house high up due to being built against the hill. Outside on the patio we were served wine, cheese, crackers and goodies that turned out to be provided by the ship. Anyway, it was really a nice treat. We were back onboard in time for lunch and heard about the other three group "treats". 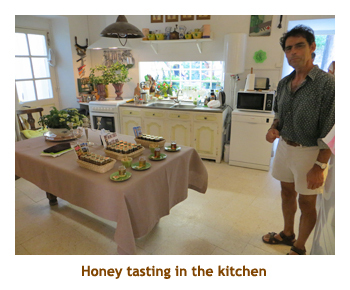 There was another house visit, an outdoor wine and cheese tasting, and a dance presention. After lunch there was an optional (and rather expensive) tour to a truffle farm and Chateauneuf-du-Pape. However, we weren't interested in truffles, and were going to be doing a visit to Chateauneuf-du-Pape on a Viator tour later when we would be staying in Avignon (after the cruise). 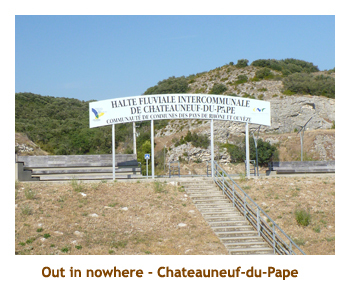 For the rest of us we were sailing to the small village of Chateauneuf-du-Pape (not to be confused with the appelation or area of Chateauneuf-du-Pape where the famous wines come from) to pick up the optional tour group (at about 6:00 PM). For dinner I had an excellent rack of lamb as we continued to sail to Avignon. 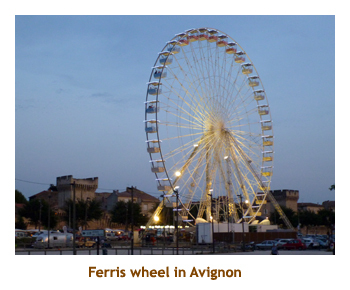 After dinner we did a quick walk along the waterfront of Avignon, where an arts festival was underway. There was a large market selling food, clothing, handicrafts, etc and a huge ferris wheel. It was getting dark so we headed back aboard for bed. We were up at 6:30 on another hot 36 degree day. We had breakfast and then headed out on a walking tour of Avignon old town. There was an all day optional tour ($$$) offered for a cooking class at the famous La Mirande Hotel, but most of us opted for the shorter walking tour. As we exited the ship, immediately ahead of us was the famous Pont d'Avignon (officially Pont St. Benezet ), constructed in the 12th century and washed away several times. With its three arches it appears to span half way across the river. However, the left bank is actually an island, so the original complete bridge had 22 arches, crossing both legs of the river plus the island in between. Nearby the ship were the fairgrounds and ferris wheel we had explored last night but this wasn't part of the walk. 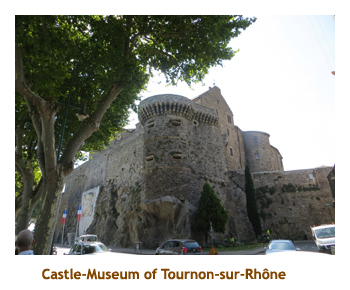 Instead, our tour took us past the city walls and fortifications, and through the old town. It was hot!! We spent most of the time exploring the Pope's Palace. 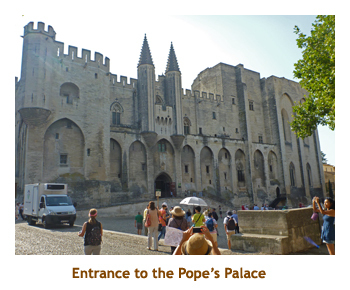 It was built during the period 1309 - 77, when the popes took up residence at Avignon instead of at Rome, primarily because of the current political conditions. I guess the pope build such a large palace to show the peasants what a great guy he was. 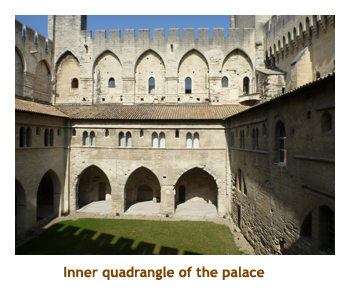 The palace complex was huge. 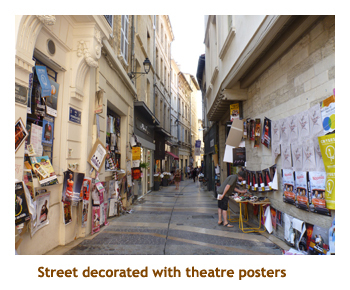 It is now mainly empty and devoid of the murals and frescos that once covered the walls and ceiling. Still impressive though. 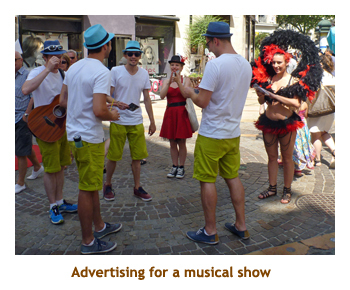 Walking through the streets of Avignon, we encountered many buskers and groups advertising for live theatre, concerts, etc. This was all to do with the annual arts festival. We were back to the ship by 12:30, in time for lunch. For the afternoon, we relaxed in the air conditioned ship reading, checking email, wandering around, etc. We did do a short walk along the dockside to see some other cruise ships, and Marjorie actually invited herself aboard a Viking ship and was given a bit of a tour while I sat outside in the shade and waited. Then it was back into the air conditioning. For our "farewell" dinner I had chateaubriande. Very good, but calling it "farewell" was kind of jumping the gun. To bed. Up at 6:30 to another 36 degree day. Phew. Breakfast time again. 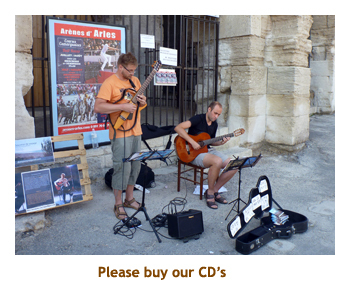 We were still in Avignon. 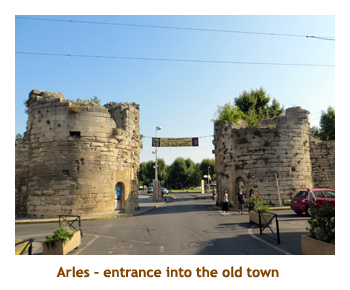 The plan for today was a morning bus ride to explore Arles as the ship sailed to Tarascon. 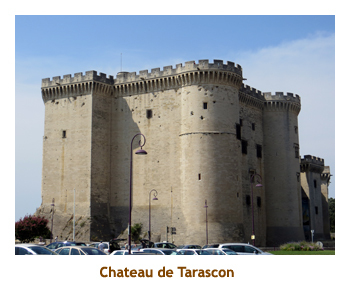 We would bus to Tarascon after the tour in time for lunch. Then there was an afternoon tour of Tarascon. 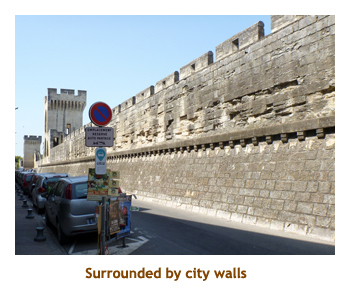 So, we joined the tour group at the buses (9:15) and headed off on a 45 minute ride to Arles. 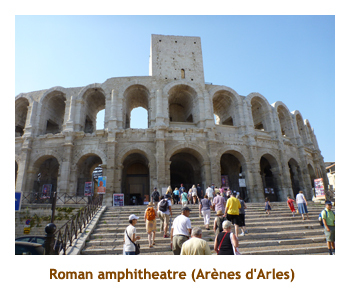 At Arles, we were dropped off at the gates to the old town and marched to the famous Roman amphitheatre. It was quite large and reminded me of the coliseum in Rome. After viewing the theatre, we continued around the old town visiting churches and gardens. 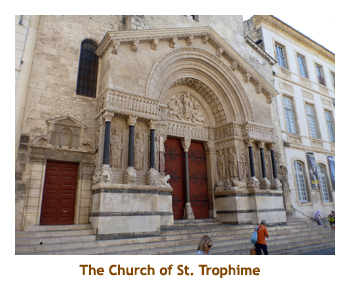 The main church was the Church of St. Trophime. We were given some free time to browse around on our own. 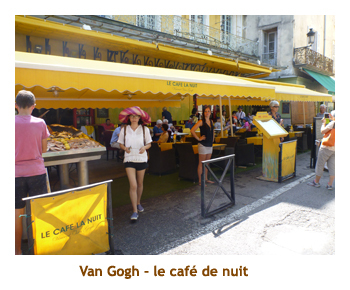 Vincent Van Gogh lived in Arles and painted many of its landmarks. We saw a number of signs in front of buildings showing his painting of the building so that you could compare. After our time was up it was back to the bus to transfer to the ship at Tarascon. It had been a really hot morning and we were wiped! Nice to be going back to the ship. 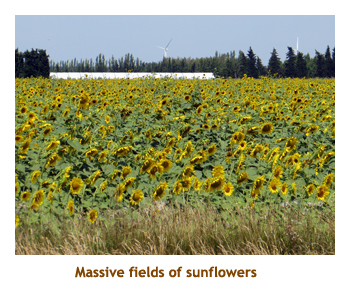 Along the way there were fields of various crops, but the most colourful were the fields of sunflowers. We had lunch and still felt that we were all toured out, so decided to skip the Tarascon walking tour. 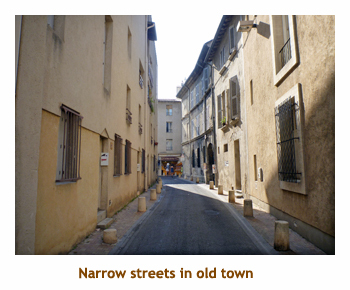 However, a while after the tours had left we felt better so decided to explore the town on our own. 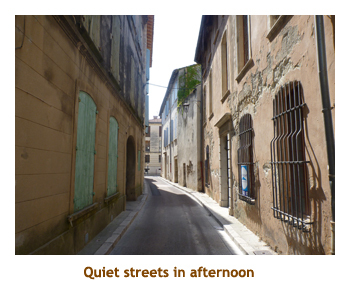 It was mid-afternoon so the streets were empty (siesta time). 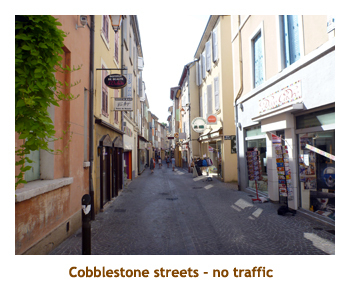 In southern France most of the businesses close from 1:00 to 4:00 (or there abouts). 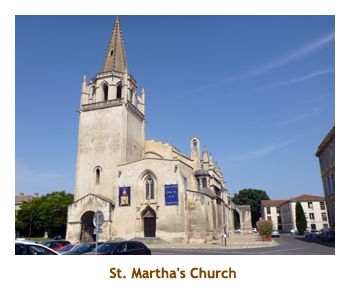 We enjoyed our walk around especially the medieval castle (Chateau de Tarascon) and the church (St. Martha's Church). At the castle we crossed the drawbridge and explored the castle. 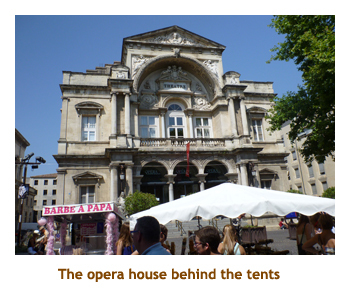 Some of the inner areas were open to the public, while other areas you needed a ticket. We just did the public areas. It was really hot by this time. Time for the ship! We were back to the ship about 4:00 and had a drink in the lounge. We read for a while to fill in the time until dinner and did some of our packing. For dinner I had pork medallions. Very good. Then it was back to our room to finish packing. Unlike ocean cruising, we didn't need to put out our luggage until 8:30 AM tomorrow, but we still completed our packing ready to go. Then it was time for bed. We woke up at 6:30 on our last day of the cruise. It was going to be another 35 degree day. 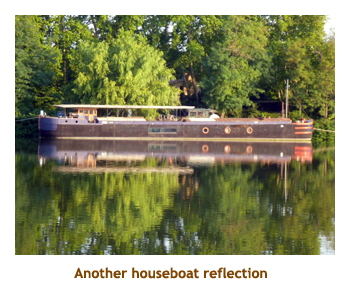 Looking out of our "balcony" window the river was dead calm, with beautiful reflections of some houseboats docked across the river. We had our final breakfast and said goodbye to our new friends. We put out our luggage and sat in the lounge waiting for our departure time. The ship had organized a taxi for us, so all we had to do was wait. At 9:00 AM we did our final trip down the gangplank and met our taxi. Our bags were there ready to load into the cab. 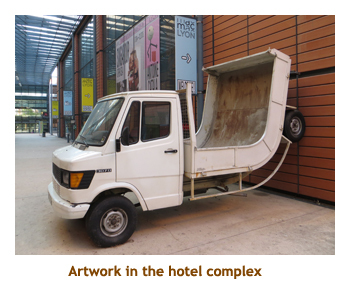 We hopped in and directed the driver to take us to the Adagio Access Hotel near the TGV station. It had been a great cruise. We appreciated several changes that Uniworld had seemingly recently made. Firstly the "all the time" drink package was really nice. Secondly the splitting of the groups for separate wine tastings was nice as the group size wasn't overwhelming. Lastly, the addition of guided bike tours in some of the ports was great. 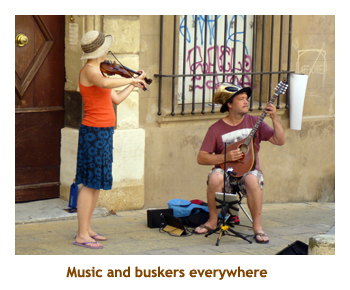 One thing we did miss was the variety of local musicians brought on for the evening entertainment. Instead we seemed to get a lot of the ship's pianist / singer combo most evenings. Cost cutting? 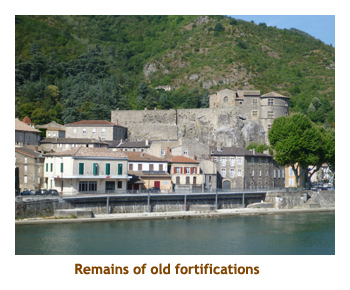 Here endith the diary of our Rhone River cruise. 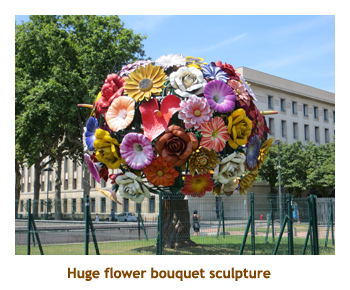 You can read about the rest of our trip in the diaries covering the land trip to Avignon and Brussels, and the second cruise from Prague to Luxembourg.